DUBLIN:Wednesday May 2nd, 2018 OriginalIrish Hotels is a new tourism and hospitality brand representing 60 owner-runhotels in the North and South of Ireland. At a press luncheon today in Dublincity centre, the new hotel collection was unveiled to the all-Ireland marketand officially launched by Minister of State for Tourism and Sport, BrendanGriffin T.D. This exciting new brand will promote andmanage reservations from both the domestic and international travel markets andrepresents the largest collection of privately-owned hotels in the country. The Original Irish Hotels website willundoubtedly be a source of inspiration and a visitor’s expert guide to thecountless ways to discover the island from historic castles, to charming countryhouse hotels, luxury spas and tranquil resorts, to chic urban boutiques. The hotels are further categorised asLuxury Haven, Spa Retreats, Walking & Hiking, Romantic & Getaway,Family Stays, Golf, Country Activity and Weddings. The collection is dividedinto 6 different regions of the country: Dublin, the Wild Atlantic Way,Northern Ireland, Ireland’s Ancient East, the Lakelands and Into The West. All sixty hotels enjoy unique locations,personalities and charm, each well-known for the quality of their offerings andservices, and catering to every budget, lifestyle and travel interest. Previously, many of the hotels wererepresented by either Manor House Hotels or Irish Country Hotels. According to Roisin Wallace, the Director ofMarketing of OIH: “We believe OriginalIrish Hotels will serve as a fantastic guide for those who are travellingin Ireland. We Irish have a reputation all over the world for our culture andhistory, our people and food and the diversity of our landscapes andcountryside. Each of our hotels has its own personality and charm, and no twostays will ever feel the same. Original Irish Hotels wants to deliver unforgettableIrish experiences in hotels that are much-loved and minded by their owners andmanagers”. Original Irish Hotels offers a range of unmissable, authenticallyIrish experiences, from fishing and falconry to fireside warmth, scenic cycletracks and winding walking trails. Original Irish Hotels takes its guests intothe heart of the real Ireland. OriginalIrish Hotels offers a choice of dream wedding venues across the country. Forspecial family occasions, there are unique private rentals available where youand your loved ones can enjoy an exclusive experience in Ireland’s finestdestinations. The Original Irish Hotels Gift Card is thegift of an experience unlike any other. With a choice of 60 idyllic properties throughout Ireland, this giftwill give your loved one’s memories to last a lifetime. Order online, by phone or email orhave them posted in a beautifully presented gift box with a copy of theOriginal Irish Hotels directory and a personalised message of greeting. 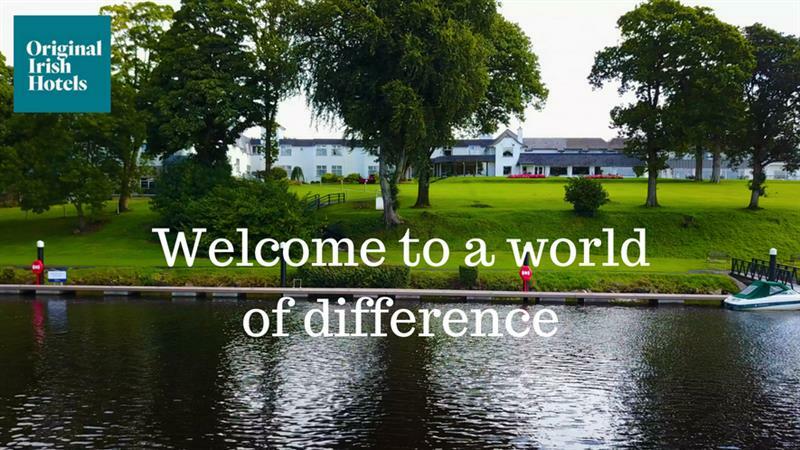 Killyhevlin Lakeside Hotel & Lodges are proud and delighted to be a part of this exciting group of Independent Hotels.